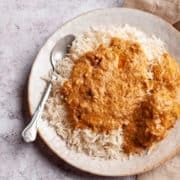 A chicken korma recipe with a twist. Tender pieces of chicken in a sumptuous and creamy almond gravy. Pure bliss! Everyone loves chicken korma in my home. But there are times when, good as it is, we tire of the same old. The solution? I still make chicken korma but add almonds to it. And my usual weekend night dish is transformed into something quite sumptuous. It has never ceased to amaze me how one ingredient can make so much difference to the taste and texture of a dish. Almonds add a wonderful body and creaminess to any gravy and this gravy is no exception. Just grind them along with the fried onions, yoghurt and cinnamon, and you have a dish fit for a feast. 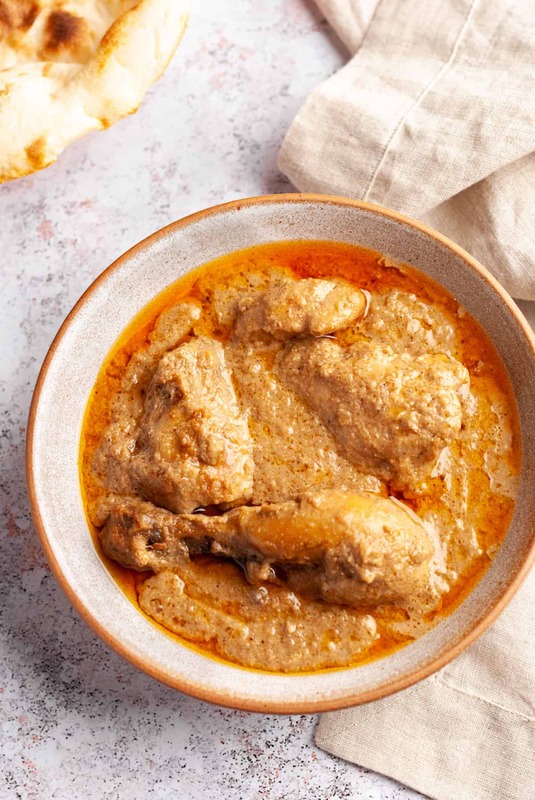 Try this special chicken korma recipe this time when you are in the mood for a chicken dish that totally rocks it! 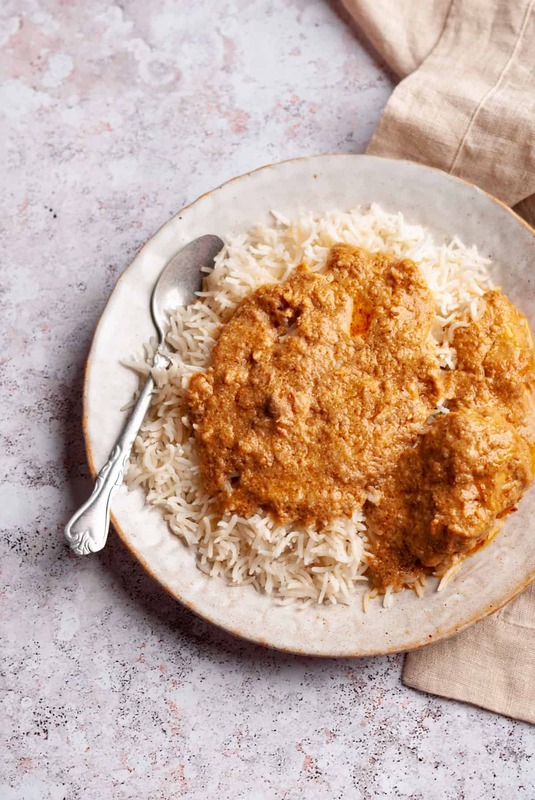 A chicken korma recipe with a twist. Tender pieces of chicken in a sumptuous almond gravy. Pure bliss! Heat the oil in a pan and fry onions till brown. With the help of a slotted spoon, transfer the fried onions to a bowl. When they cool down a bit, mix with yoghurt, cinnamon and almonds. Puree in a blender or food processor. It should be a smooth, lump- free paste. In the oil in which the onions were fried, add the bay leaf and cumin seeds. When they turn golden, add the chicken and stir fry for 5 minutes. Stir in the ginger-garlic paste along with the powdered spices – red chilli powder, coriander powder, garam masala and salt. Cook on a medium flame till the oil leaves the side of the pan, approximately 10 minutes, then cover with a lid and cook for another 10 minutes. Add a splash of water if required. Take off the lid and stir in the almond puree prepared in step 1. Add a cup of water, cover and simmer for 30 minutes. Garam masala is readily available in Indian stores. But if you want to make your own, which I prefer doing for this dish, just take 10 peppercorns, 5 cloves, 1 black and 3 green cardamoms (peeled) and grind to a fine powder in a spice or coffee grinder. You will get the exact amount needed for this recipe.